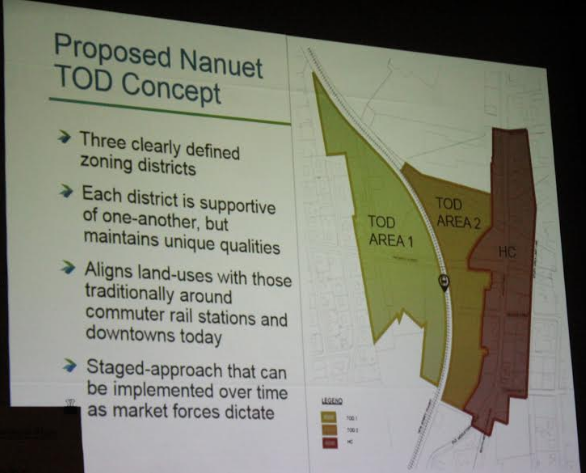 27 ½ acres surround the Nanuet train station, which residents of the Hamlet would like to see re-designed into a “transit oriented development” (TOD) that would attract Boomers and Millennials to live, play and take the train to work each day. Town of Clarkstown held its second meeting on the proposed zoning changes at Nanuet High School on Monday, April 3 to show the changes made to the original presentation made in mid-November after listening to suggestions by Nanuet residents on how they foresee the historic hamlet re-designed. Its 27 ½ acres is broken into three sections, where zoning changes would take place to encourage development to create a hub for those who’d rather walk to the store than jump in the car. With $150,000 grant from NYSERDA and an additional $50,000 from Clarkstown, Nanuet has hired two consultants, Cambridge Systematics and AKRF Consulting have been working to make the changes that would bolster the hamlet’s economy and encourage developers to revitalize buildings that have long sat dormant. The town plans to invest in the current parking lots, create plantings and make upgrades to the train station, but that cost will be borne by the municipality, since the MTA owns the property and has expressed no interest in doing any upgrades. “What we can do is make it more attractive,” said Joe Simoes, Clarkstown’s Planner. Both the Nanuet Chamber of Commerce and the Nanuet Civic Association have been working side by side with the town planner and the consultants on how best to re-purpose the 27 1/2 acres that comprise the bulk of the hamlet. “It’s an historic area but close to shopping right on Route 59,” said Roberta Bangs of the Nanuet Civic Assn. Currently, one part of the “TOD” is zoned light industrial and will remain that way for businesses who already have businesses open there. “They will be ‘grandfathered’ in,” said Simoes. The planners are suggesting storefronts with apartments above them—something every city dweller has taken for granted till they moved to the mid-Hudson. “No building can be more than 30 feet in height,” added Simoes. Clarkstown and its planners hope to unveil the final project in June at the Nyack Street Fair. One resident in the audience commented, “It would be wonderful if we could re-design the Hamlet to look like Stone Ridge (NJ), an assessment fellow residents agreed upon. For more information on the Hamlet of Nanuet’s plans for revitalization, the website ishttp://townlclarkstown.ny.us/html/Nanuet_TOD_Project.html.